Article first published as Interview: L.B. Johnson, Author of ‘Saving Grace: A Story of Adoption’ on Blogcritics. LB Johnson is an adoptee and a birth mom, a rescue dog Mom and a wife. Growing up on the West Cost she left a small town for a job flying for both the US Government, then an airline, finally hanging up her wings at 40, wishing to be in the same time zone for a whole day. She finished her Ph.D. and took an investigative position in law enforcement, following in her Mom and Dad’s shared career field(her Mom was the first female Sheriff in her county). She lives in Chicago with her engineer husband and is active in animal rescue. Sheri: Welcome LB, and thank you for being with us today! Why don’t you start by telling our readers a little bit about yourself? LB: For starters, I don’t use my full name in public to keep my family's privacy in light of my career field . No, it’s nothing like on TV – I don’t have a jet to whisk my team of specialists around, I don’t dress like a model and nothing is solved in an hour, not even figuring out what we want to order for lunch. Since I’m still employed, I was not at liberty to discuss the details of my work in the book, though there are themes and situations that anyone that's worked a crime scene or been a first responder involving loss of life, will relate to. 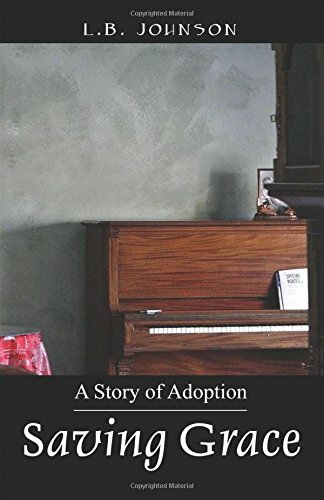 Sheri: What is Saving Grace: A Story of Adoption about? LB: Saving Grace is a memoir of several lives that intersected. My own as an adoptee, as well as that of my daughter, who I gave up for adoption when I was a teen, just starting college. It chronicles the life my brother and I came to know growing up, and how it laid the groundwork for a decision I’d not have likely made otherwise. It also details how the souls we bring into our lives, both two and four-legged, become our family, even if they are not related by name or blood. It’s told in a series of vignettes, as if you were reading from a diary, as opposed to the typical narrative of a memoir. Sheri: What was your inspiration for this story? LB: My Dad had outlived two beloved wives and two children (a child who passed before they adopted us). I wanted to chronicle our childhood for my Dad as well as detail the relationships that formed and sustained me after I left his house to make my way in the world. Dad’s not much of a reader, but he said he’s read Saving Grace four times and finds a new memory each time. Sheri: You were adopted at a very young age, along with your brother, Allen. Is Allen your biological brother? The bond between the two of you is undeniable. Can you tell our readers about your special relationship with Allen? LB: It wasn’t until my birth certificate from Washington was unsealed after Saving Grace was published that I confirmed we weren’t siblings. We were both redheads but didn’t know for sure. My parents were very vague as to our origins, and we weren’t sure if we were adopted from foster care or adopted outright. To our parents, they WERE our parents, and I understand their not wanting to go into detail as to our background. We were so young, I was just an infant and have no memories, but our earliest photos have us pretty much inseparable. Sheri: Your parents told you and your brother that you were adopted when you were still at a very young age. What was your initial reaction to the news? LB: I was about four when they told me. I thought it very cool – that we had been CHOSEN. I went to school and told EVERYONE. I always looked at it as not being given up, but having been embraced by someone who needed me more. Sheri: It seems you never gave it much thought, aside from a brief consideration when you were a young teenager. Then not again until years later, when you made the decision to give your own daughter up for adoption. What made you decide to seek out your own mother? LB: After my Mom died, I did try and find out who my biological parents were, more from a “background/medical history” standpoint than anything emotional. When Saving Grace was written, there were no records at all as to my biological parents, so I just let it be. I had a family I loved dearly, that was all that mattered. Sheri: How did you feel about what you found, knowing how much hope you placed in your own daughter seeking you out one day? LB: It was bittersweet, but I went into the open adoption with her knowing full well, she may not want to meet me someday, and I would have to accept that, just as I had to accept that my biological parents had personally painful and complex reasons for giving me up and not trying to find me that I had to respect. Sheri: I loved reading about your childhood. What an incredible experience! A loving home with a mom and dad who were best friends, doing everything they could to raise you and your brother in the best way possible. The lessons they taught, and the lessons they let you learn on your own. I’m sure you realize now that you had some pretty amazing people in your lives, did it ever occur to you as you were growing up? LB: I had the oldest parents on the block, they were almost 40 when they adopted us, but I thought also they were the coolest parents. Having been married many years, they dealt with the hard times with humor and were pretty laid back, strict but not losing it over little things like the time I walked into the house, holding the back bumper of my Volkswagon saying "Uh, Dad, I had a little accident. . . ."
Sheri: You lost your mother when you were just becoming an adult. What can you tell us about your most memorable experience with your mother? LB: My Mom and I used to hunt for agates, along the shores of local bodies of water, stones that may not have been unearthed for years, embedded in earth and sand. They're quiet treasures on the shores of the West, wind-swept lands riddled with unclaimed treasures that people simply pass and forget, not knowing what they have underneath their feet. Beneath this great land lies jeweled richness of stone and prehistoric bones, telling tales as they surface, dotting the future with pieces of the past. Some were tiny, some took both hands to hold, but Mom and I would search through the gray, dark, and cold surfaces looking for the one that we could break open into glorious colors, rich colors forged in head and fire and fate. I look at those stones on my shelves, with the bones that I studied in school and remember her every day. Sheri: Keeping in that line of questioning, what was the best advice you ever received from your father? LB: When I was a teen, I was a volunteer at a nursing home. The elderly people thoroughly enjoyed the visits, and often would keep me in their room for what seemed like hours to someone my age, as I brought juice and some blessed company. But for a teenager, it was not a fun way to spend the afternoon and one time when Dad was dropping me off, I said, "You know, I don't really want to do this." The silence echoed in the car like a question. Then Dad quietly said, "Did you tell them you would do it?" I said, "Yes." That was that. I knew exactly what he meant. When you commit to helping someone in need you don’t back down, even if it’s not pleasant. Sheri: Your amazing experiences didn’t stop at childhood, you certainly went after your dreams with the attitude that you can do anything, earning a doctorate in Criminal Justice – AFTER you finished your career as a commercial pilot, no less! What sparked your interest in flying and what do you feel when you are up in the sky with the birds? LB: Well – I can assure you I don't do everything. I was always the last kid selected for sports in grade school, you don't want to see me golf, and if I sing, cats will gather on the porch! I wasn't quite sure how I ended up as a pilot, I'd always been fascinated by trains and cars, machinery in motion. I took that first lesson on a whim, daring myself to dare, and I was hooked. When I got a job at the little local airport to pay for the lessons, I heard my Dad say "she won't last a week." The work was as physical as anything I'd ever done, driving a big gas truck, hauling out the hoses to the plane, climbing up ladders and fueling. We won't mention to OSHA that float plane I fueled with a ladder on top of a picnic table to reach. But I lasted a week, and then some, sitting in my room at night with my books and my study guides saying "I'm going to be a pilot" as a mantra to parents that love but don't always believe. There is no feeling like it, especially in an old, open cockpit plane. The solitude. The air. Something I can find no other place, time that wavers slowly while I lean back against the leather seat and close my eyes for just a moment and breathe deeply. Head thrown back, you can stick your hand out into the air, the temperature of a lover's soft breath. Time just seems to melt into the horizon and all you have is the breeze - fresh air, to cool you quick so you can rest, to blow out of your eyes and brain and blood, all that was making you hot and weary. It is addicting. Sheri: Your writing style is phenomenal – haunting, really, and I mean that in the best possible way! You certainly know how to capture an audience, as I was captivated from the very first pages. How long has Saving Grace been in the works? Did you have a knowing deep inside, that you would one day share your story with the world? LB: I had written a couple of short stories for magazines, and those that read my little craftings on social media said, "You have to write a book!" I never thought I could, not having any particular training in English or literature, being a math and science geek. But when I wrote The Book of Barkley, and it hit #1 I thought – Saving Grace is the story I’m finally ready to do. Sheri: You have lots of words of wisdom in your story. A favorite of mine is: “We do not cease from our experiences; in the end we arrive back where we started, seeing our struggles as if for the first time, but at a nice safe distance with wisdom otherwise not gained.” So wise, yet so simple and straightforward. Where did you learn to handle things - life, with such a realistic attitude, and how do you stay so positive and focused, even through seemingly difficult experiences. LB: I’d probably best say that sometimes chocolate and a good single-malt scotch helps. But mostly I learned it from my Mom. She dealt with cancer much of my childhood, and never cried or complained, doing all she could to give us a normal life, one that just included cancer. I realized that whining and complaining doesn’t “fix” anything, it just makes everyone around you miserable. Also, being a pilot means understanding that being focused isn’t just a nice idea, it’s the only thing keeping you alive. It puts things in perspective. Sheri: What was your biggest challenge in writing Saving Grace? LB: It was crafted from a couple of notebooks of short snippets of thoughts that I’d jotted down for my daughter over the years, so if I met her I could fill her in on my life between her birth and our meeting. The notes were short and rough, and sometimes hard to read (handwriting is NOT my strength). I ended up writing the book as a series of vignettes, as if from a diary. Sheri: Is there a special message you hope readers take away from your story? LB: Sometimes the smallest decisions become our biggest acts of courage. Sheri: What is your relationship with your daughter today? LB: I try and respect that she had parents when I came along and not hover around too much, but I’ve visited several times over the years, and we exchange emails and phone calls now and again. Just knowing she is safe and happy is all I need. Sheri: Your first book, The Book of Barkley, published in 2014, was a number one bestseller on Amazon. Meeting Barkley in Saving Grace, I feel like I know a bit of his story, but I am so intrigued by your writing style that I feel like I'm missing out, and will have to circle back and read more about him! Can you describe the significance of getting Barkley's story on paper? LB: Barkley was not just your typical Labrador retriever, he was literally my only family close by when work took me across the country. Losing him to cancer within a couple of weeks of losing my brother was a catalyst for capturing those memories, focusing on the joyous journey, not the ending, though you'll want some Kleenex in the first chapter. The fact that all the sales have helped animal rescue groups across the country has been a joyous outcome from something that could have been just memories. Sheri: So we have The Book of Barkley, and Saving Grace: A Story of Adoption, yet there seems to be so much still unwritten about your life’s experiences. Are you planning another novel? LB: I took a year off from writing, as two books in one year, was pretty intense. But I’ve started on two more, one about flying (not my career specifically, simply flying in general) and one about life in small towns as seen through the eyes of several generations. I hope to have them out in 2017 and 2018, respectively. Sheri: Tell us a bit about your life now, what are your interests? What do you do in your free time? LB: Free time? What’s that? My husband, who is 25 years my junior (and yes, I know ALL the cougar jokes) and I are restoring a 100-year-old Mission Bungalow. He's an engineer and I can make a mean sandwich, so between the two of us, we've gotten a lot done and it has been fun. But we are definitely homebodies who enjoy music (he plays the violin, I play piano),cooking, and reading. LB: We all have stories in us. If you want to write a book, just sit down and let those stories be told. Sheri: Before we go, can you tell us about your website and what additional information can be found there about Saving Grace: A Story of Adoption? LB: The author’s website has ordering info, any specials or giveaways on the books, as well as current reviews from literary organizations. I have also included a chapter to one of the next books as well as information on the animal rescue groups the books are currently funding. Sheri: LB it was an honor and a pleasure chatting with you today and I look forward to seeing more work from you in the future. Thank you again for stopping by.